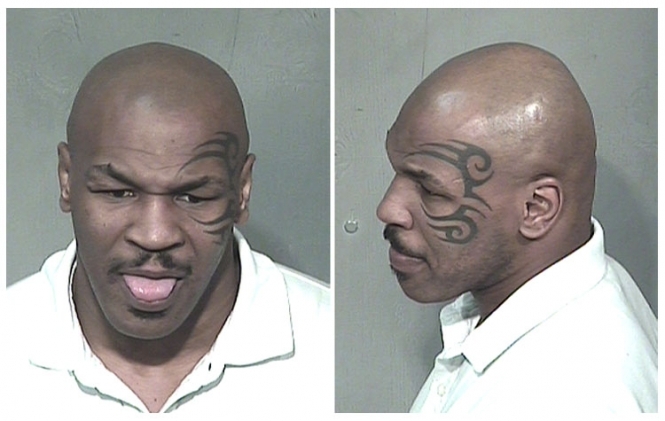 Former heavyweight champion Mike Tyson was arrested in December 2006 on drunk driving and cocaine possession charges following a police stop outside an Arizona nightclub. Tyson, 40, was pulled over when his BMW nearly struck a sheriff's cruiser after he left a Scottsdale bar. When he failed field sobriety tests, the pugilist was arrested for driving under the influence. A subsequent search turned up two small bags of cocaine in Tyson's pocket and another bag in his car. He was booked into the Maricopa County Sheriff's lockup, where the above mug shots were snapped. Submitted by Hank Scorpio on Sat, 2010-08-28 03:14. Holy crap! I'm not from Scottsdale, but I had a family reunion when that happened. That evening that he was arrested, I was at a stoplight when a black bmw, with tinted windows pulled up to my right. He proceeded to try to race me, "I have a pontiac firebird". I didn't even try being my wife and young son were in the car with me. We couldn't see inside that car, but.. we were right in the area, and time he was caught. I'm 97% sure it was Tyson. When I saw the news the next morning, I couldn't stop laughing!! Even now LOL! !